Let’s tackle the first question first – have the traditional mithais finally been replaced with chocolates, and other sweetmeats? Cadbury was the first to try to capture a share of the sweet tooth of Indians. It first launched a festive pack back in the early 1990s to switch consumers from mithai to chocolate. A very western concept then, it has finally gained momentum now. Cadbury launched the Raksha bandhan pack to tap into the younger segment, then innovated and introduced the Cadbury Celebrations Rich Dry Fruits Collection – a combination of dry fruits and chocolate – ideal for Diwali gifting. Amul & Nestle also soon followed suit with their range of chocolates. The campaigns like ‘Pappu Pass Ho Gaya’, ‘Kuch Meetha Ho Jaaye’and ‘Shubh Aarambh’ have tried to create new occasions for consumption and attempt to change the positioning of Cadbury from a regular chocolate to sweets (Meetha). In 2009, Britannia launched “Shubh Kaamnayein”, a range of gift packs for Raksha bandhan. The gift packs contain various biscuits and cakes like Britannia Bourbon, Jim-Jam and fruit flavored cakes like Berry-Cherry and Pineapple. They also launched a Christmas range with a variety of cakes. Diwali and Onam are also expected to see active participation by Britannia. Then there are others like Coca Cola and PepsiCo who introduced gift packs for multiple product lines. In 2007, PepsiCo introduced a range of Diwali gifting packs of its popular CSD brands. “To make this Diwali exciting, the packaging is designed in such a way that one can make it into a ‘Kandeel’ (lantern) or use it as a stencil for creating attractive Rangoli patterns.” according to Punita Lal, Executive Director-Marketing, PepsiCo India. Coca Cola also offered coke cans in similar packaging. PepsiCo now has a Nimbooz Diwali pack with 5 bottles of Nimbooz and 3 decorated diyas (traditional lamps). It also launched its top-selling snack brand Kurkure in a diwali pack. Parle Agro introduced Appy and Hippo in gift packs for Rakhi this year. Chennai-based Cookie Man says that 30% of its turnover comes from Diwali sales. 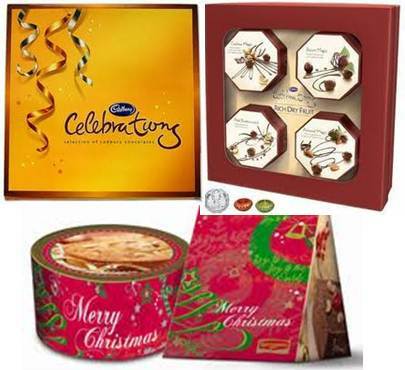 “The pack is customized and can include up to seven premium varieties of chocolates and chocolate-dipped cookies, apart from other varieties,” says Sandeep Sewal, Cookie Man senior vice-president, which bagged orders of Diwali gifts from nearly 300 companies in 2009. Now to the other question – Are other food items replacing even the modern sweetmeats? Are people finally getting more health and weight-conscious and opting for healthier alternatives? Possibly amongst a certain segment. Not only are these healthier foods substituting other products in the kitchen cabinet, but are also becoming popular gifting options. Surely the manufactures have noticed this and have launched gift packs. Some examples include Dabur Real, Tropicana, etc. In 2006, Dabur introduced four gift packs of Real and Real Active juices. “We have introduced juices as giftable items keeping in mind the growing consciousness of people towards fitness and health…” said Mr Amit Burman, CEO, Dabur Foods Ltd. This range has now grown to 16 variants. 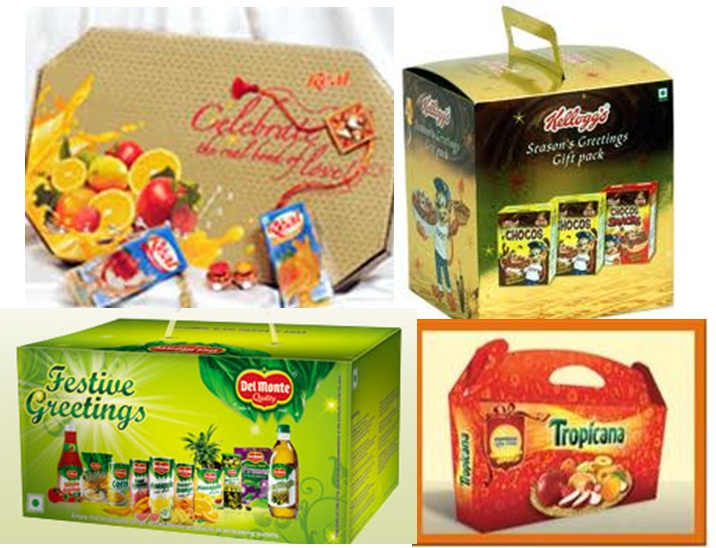 Dabur claims sales of its range of juice gift packs in 2010 festive season are almost 40% more than the previous year. “Tropicana holds 60% share in the Pepsi brands sold this [festive] season,” Mr. Homi Battiwala, VP-Marketing, PepsiCo India, said, as a proof to the growing importance of juices as gift items. Also, Kellogg’s introduced a festive season pack for their brand of Chocos cereal. Del Monte branded processed foods and beverages unveiled Del Monte gift packs for Diwali in 2009 comprising of its range of packaged fruits, ketchup & sauces, whole kernel corn, Italian pastas, table olives and olive oil. I think there’s been a definite shift from mithai to chocolates and desserts and also towards healthier food alternatives, at least amongst a certain segment. What do you think? Entry filed under: Category Evolution, Consumer behavior, Consumer Trends, Evolving India, Observations. Tags: Appy Fizz, Britannia, Cadbury, changing India, Chocos, Coca-Cola, Cookie Man, Dabur Real, Del Monte, festive gifting, festive packs, Kellogg's, Nimbooz, packaging, Parle Agro, Pepsi, Tropicana. Healthy food items replacing modern sweetmeats? Potentially yes. But am not too sure the modern sweetmeat is replacing traditional mithai. To me it appears though a segment preference was idenitfied and is being catered to, rather than the whole market being pulled away from its existing preference. Unless there is market-wide evidence that the traditional mithai is finding lesser acceptance, the advent of newer sweatmeats would not necessarily mean a shift. I believe there is place for all in the Indian market, whichever palate/segment one chooses to target. Long shelf life, attractive packaging, hygiene, ease of storage, association of chocolates with gifting, western influence, experience brought in by the the Krafts and the Nestles from other markets are some reasons I can think of, for the ‘chocolate gifting’ segment to evolve. The market for healthy packaged food (for gifting) is only a sub-segment of this segment, in my opinion. Am quite curious to know what an online retailer like http://www.mithaimate.com may have to say about the preferences, considering they sell both traditional and modern sweets. Thanks for your comment, it is nice to see you commenting on our blog regularly. As mentioned in the post, completely agree with you that this replacement is happening only in a segment of the population, but does it have potential to evolve? These products are aspirational for the next tier of people and therefore over time could percolate into the next strata of the population. There is always aspiration to upgrade, and just as the relatively lower tiers would upgraded within mithais, the middle tiers could upgrade to chocolates and other modern sweetmeats. This shift will also depend on how much companies will invest to encourage it.